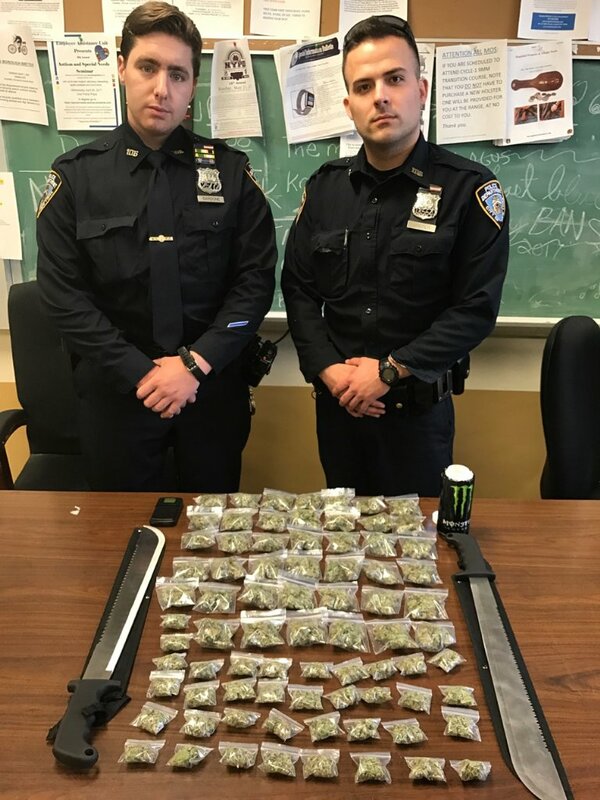 Two NYPD officers posed on Twitter after busting a local dealer, who was carrying little bags of ganja, a few machetes, and a can of Monster Energy drink. You got to love (not really) when cops brag about finding a little weed. Despite the fact that 61% of American think pot should be legal, the police still think cannabis busts are worth boasting about on social media. You don’t know whether you should laugh at them, or feel super sorry for them. Two NYPD officers posed on Twitter after busting a local dealer, who was carrying little bags of ganja, a few machetes, and a can of Monster Energy drink. At the present time, 61% of Americans are in favor of legalizing the herb. But that’s not stopping Sardone and Winter, two NYPD officers of the 106th Precinct in Ozone Park, Queens. It turns out that these guys took down a local dealer, who had more on him than just weed. In addition to a couple of grams of bud, he also carried some machetes. And worst of all, a Monster Energy drink. Of course, they decided to post the goods on Twitter. It was only appropriate that they also do a little pose. You know, to make it seem like they did the community some sort of favor. Apparently, the Tweet didn’t get very much attention. So, they decided to retweet themselves once the first photo posted. As a result, everyone on Twitter immediately started roasting the officers. It was the only appropriate thing to do. They wanted a reaction, and they got just that. Clearly, feeling the need to brag about some tiny bags of weed caused people to respond in a way that they didn’t expect. But again, they asked for it.